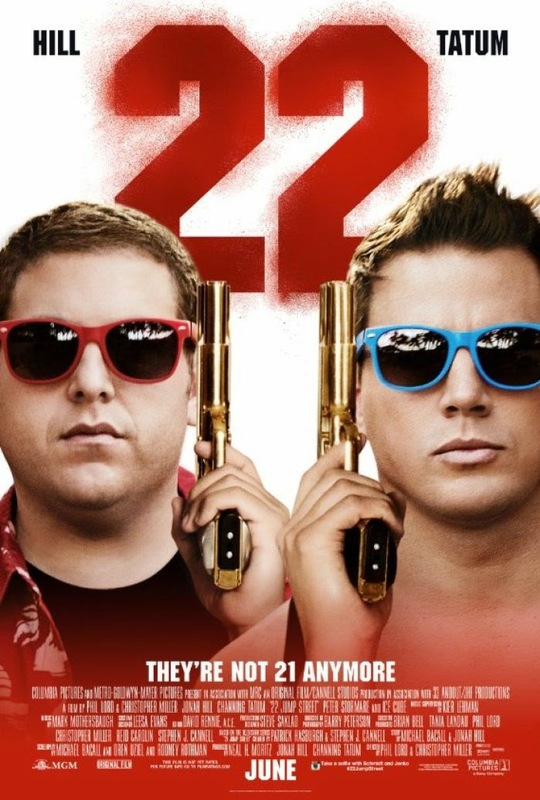 Synopsis: After struggling to find success after their first undercover gig, police officers Jenko (Tatum) and Schmidt (Hill) are ordered back to the Jump Street division run by Captain Dickson (Ice Cube) to do the same kind of undercover mission they did so well the first time...but this time they're sent to college. Yup, just like the end of the first film said they would! Sarah: Hello readers! We were back at the movies after a quick little weekend getaway to visit the family, and the other night we checked out this past weekend's big comedy blockbuster release, 22 Jump Street. 22 Jump Street is the much anticipated (by us at least) sequel to 2012's hit 21 Jump Street, the film reboot to the old popular television show starring Johnny Depp. Channing Tatum and Jonah Hill once again star as undercover police officers Jenko and Schmidt, and Phil Lord and Christopher Miller returned to direct this, too. Andrew, this movie was packed with hilarious moments and even a little heart! What did you think of 22 Jump Street? Andrew: Well first I think we'd be remiss if we didn't mention that 21 Jump Street was one of the earliest reviews we ever did for our blog. And back in 2012 we gave 21 Jump Street a 4.5/5 clapboard review. I stand by that grade because I still think it's a hilarious reboot of the old television series and was filled with great nods towards not only the TV show, but perfectly made fun of buddy cop movies, shoot 'em up action flicks, and subverting high school cliches while embracing all those things, too. 22 Jump Street does just as well by lampooning the idea of movie sequels, but it embraces it and all the college comedy tropes, too. I loved this new entry in the series and I want to say that I think they improved on the first one, even if a large part of this movie's success is that it's almost follows the first one beat for beat. What did you think, Sarah? S: I loved this movie! I liked the first one, I thought it was very funny. But this one just took it up a notch! The self deprecation was fantastic and the action was just that much funnier. I can honestly say that I have not laughed this much in a movie in quite a long time. One of the things that made me laugh so much was that it seemed so organic. The chemistry before the two main characters is so unlikely and yet perfect that they just lend themselves to hilarity and hijinks. A: The biggest thing going for these films, by far, is the chemistry between Channing Tatum and Jonah Hill. Like you said, they just come across so organically. It also helps that Tatum continues to embrace this kind of comedic role and just goes with it. Hill is funny, but Tatum is the best part of these movies, in my opinion. Let's talk about the main source of humor for this film for a second, which is how they draw so much attention to the fact that it's a sequel. Almost the entire first act makes constant jokes about sequels - how they have bigger budgets, how they're usually not as successful, how most of the time they just recycle what made the first one work so well, etc. But it works! And it's phenomenally funny! The moments when they make fun of sequels reminds me so much of the old Zucker, Abrahams and Zucker comedies like Airplane! and The Naked Gun. They call specific attention to things like how they've moved the Jump Street division's headquarters across the street to 22 Jump Street, but do it in such perfectly spoofed way. S: Oh yeah, I totally got an Airplane! vibe from this movie. I would have to say that the first act was actually my favorite part of the movie, where most of those sequel jokes came in. I love when movies make fun of themselves and throw in little nods to the actors names or past performances. It's cheesy and juvenile, but I don't really care. It's freaking hilarious! That kind of humor is what I think sets this one apart from the first one. They're making fun of themselves again, yes, but in a way that seems less connected to the original television show and more about establishing their own mark with the brand. It was a creative way to go and I thought they pulled it off perfectly. The new faces in this movie were a lot of fun too! Amber Stevens (Greek), Jillian Bell (Bridesmaids) and Wyatt Russell (pretty much an exact replica of his father, Kurt Russell) added a great second layer to the college aspect of the whole movie. A: The supporting cast was pretty good, for sure. I thought Russell in particular was great as Zook, the jock/frat bro that Tatum's Jenko immediately connects with once he and Schimdt go undercover in college. He had a great chemistry with Tatum, too, albeit a different kind from Hill, which fit perfectly for the film. And yeah, he looks like he got all the best genetic parts from his parents, Kurt Russell and Goldie Hawn. Stevens isn't given a ton to do as Maya, the girl that Schmidt hooks up with and ultimately falls for. She's fine in what she has to do, but the hilariousness of her character's role isn't really given to her at all. I don't want to spoil what that is, so I'll leave it at that. Bell isn't really in the film that much despite being prominently featured in the trailers, but she's funny as Maya's put-upon roommate that has to deal with Maya and Schmidt's all night sessions. Her dry one-liners when she insults Schmidt are perfect. 22 Jump Street also gets a boost from a number of cameos, much like the first one, and none that I really want to spoil either. Ice Cube is also given more to do this time around as Captain Dickson and the movie is all that much funnier for it. S: I really likes Ice Cube's bigger role in this movie. I think that his angry humor perfectly balances out Tatum and Hill. It's all just so goofy that it works. I will say that I think it dragged a little bit in the middle but I was really okay with that. It didn't really distract from the basis of the movie, more like gave the audience time to rest their cheeks from all the smiling. I don't know, I thoroughly enjoyed this movie and thought it was one of the funniest movies I've seen on the big screen in a while. A: I do think the plot maybe drags a little bit in the middle, as it's a rather generic plot and - again - purposefully similar to the first film's plot. But I was okay with that because we got a nice look at the relationship between Schmidt and Jenko and how the dynamics between them were different this time in their college roles compared to the high school roles they played. Also, yes, it was nice to get a breather. Overall, I also thoroughly enjoyed this movie. It was exactly what I was hoping it would be and it did not disappoint in the slightest. (Okay, maybe I was a little disappointed Johnny Depp wasn't in this one, but that's kind of understandable considering what happened in the first one.) This was a laugh a minute comedy to me, with a good mixture of chuckles and legit belly laughs. Kudos to Phil Lord and Christopher Miller for doing it yet again this year after already bringing us the fantastic The Lego Movie. So far these guys can do no wrong, and while I'm sure they will eventually because every director does, I think we can feel confident that these guys will keep bringing the funny for quite some time. Oh, and without giving anything away, can we say really quickly how amazing the credit sequence is? S: I agree. I laughed so much and that's really all you can ask for with a movie like this. And yes, the end credit sequence is amazeballs. It was just fantastic and yet another reason why Hill and his group of guy friend superstars might be the coolest friends ever. I loved this movie and I'm giving it a 4.5/5. You have to go see this while it's in theaters. Laughs for the whole (adult) family! A: I'll give it 4.5/5 as well. I really, really, really want to give it a 5/5, but it's not quite to that level. Still uproariously funny though. We'll definitely own this one, too. If this is being compared to the likes of "Airplane" in your review. I really need to see this. I enjoyed the first one a lot and something tells me. I will enjoy this one a lot too. Great review.